The release fork is a central element of the clutch system. It is connected on one side with the push rod of the clutch slave cylinder and with the release bearing on the other side. Fluid pressure is created in the master cylinder by pressing the clutch pedal. This is transferred directly to the slave cylinder through the hydraulic line. The cylinder‘s push rod operates the release fork which moves in a specified direction at the same time due to the membrane spring of the pressure plate through the release bearing (released or pressed clutch). This means that the driving plate can run freely. 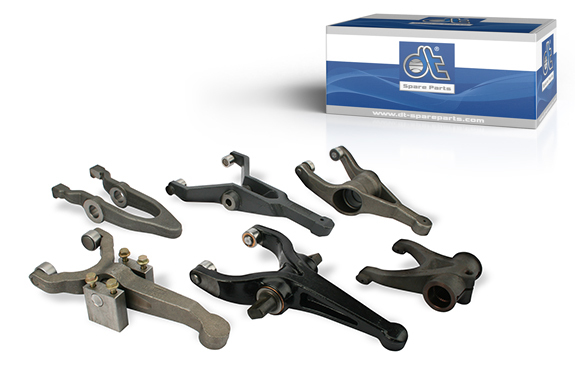 All forged and cast raw parts are checked for deficits (cavities). Edges with hardened contact surfaces. Systematic implementation of service life and noise tests on the individual pressure rollers. The contact surfaces (radii) of the bearing sleeves are adapted to the push rods of the slave cylinder using state-of-the-art measuring and production technology.